Northern Michigan has abundant trophy smallmouth bass! The Grand Traverse Bays in Traverse City and numerous inland lakes make Northern Michigan a world-class smallmouth bass fishery. Water clarity ranges from 20 ft. on many inland lakes to over 40 ft. at times on the Grand Traverse Bays. Spend a day with Wolfe Outfitter's expert Captains and Guides chasing smallies in the shallow sandy flats, or sight casting in the gin-clear waters of Northern Michigan. Wolfe Outfitters offers both fly and conventional gear guided fishing trips for Michigan smallmouth bass. Top-notch rods and reels will be provided for your trip. If there are specific rods, reels, lures or flies that you would like to use, please feel free to bring them along. Northern Michigan weather can be unpredictable, so it is always important to dress for the occasion. Mornings can often be chilly, so jackets and/or sweatshirts are recommended. There will be plenty of room on the boat to stow any extra clothing that could come in handy during the trip. Water and sodas will be provided for the trip. Northern Michigan is home to some truly spectacular lake trout fishing. Wolfe Outfitter's Captains and Guides specialize in light-line presentations for these amazing and beautiful fish. Casting and vertical jigging are the two primary techniques used to target lake trout, and with rod and reel in-hand, customers have the opportunity to land these feisty fish using light bass tackle. Recent dietary changes in lake trout have led to these fish being just as excellent a table fare as the highly sought-after salmon. Wolfe Outfitters fishes for lake trout on Grand Traverse Bays, Platte Bay, and out of the Port of Frankfort. Wolfe Outfitters' DNR inspected boats comfortably and safely fish these big bodies of water. Top-notch rods and reels will be provided for your trip. If there are specific rods, reels, lures or flies that you would like to use, please feel free to bring them along. Wolfe Outfitters also has the perfect opportunity for anglers to get their kids out to fish on an inland lake close to the Port of Frankfort: Crystal Lake. Known for its outstanding yellow perch fishing, Crystal Lake is also home to a spectacular rock bass population. These feisty fish are the absolute perfect fish for anybody who loves to catch fish, as well as a truly great way to introduce children to the fun sport of fishing. Crystal Lake's rock bass grow much larger than in just about any other lake, and 'rockies' over 2 pounds are regularly caught. Rock bass out of Crystal Lake are also incredible table fare, and are perfect for a fish fry! 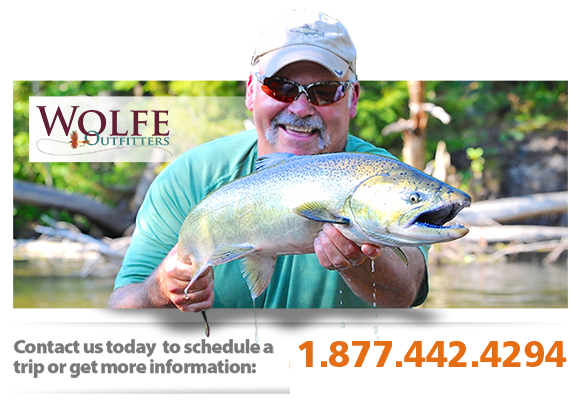 Wolfe Outfitters' Guides know Crystal Lake intimately, and love to take people out on this gorgeous body of water.